A photographic essay of how Chapel End pond was reclaimed back to an attractive environmental pond from being an unloved, overgrown shallow pit. A pond has probably always featured in Chapel End as long as people have been around. It may have been created after clay was dug out for bricks or its just a shallow depression where water has lain. In our first photograph we see the edge of the pond without a fence this was probably to allow cattle and all other farm livestock to drink from. Its quite easy to forget that mains water was not available until the late 1940’s so water was either well drawn, harvested from roof’s or accumulated in ponds. 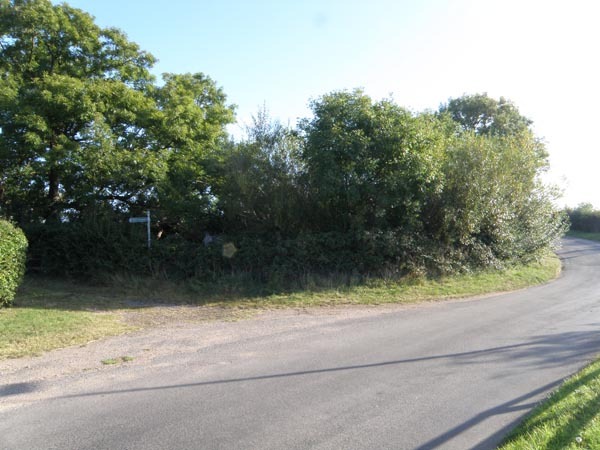 As an aside the photograph above shows a curved 4 rail fence, this was replaced with post and wire and then back to post and rail (evolution) The cottages adjacent to Woodway farm were demolished in the late 1960’S. Now we are crying out for small rural housing. Chapel End pond as it was at 8.40am on September the 10th 2009. Anyone not familiar with the area would be hard pressed to suggest there was a pond there. Overgrown with willow and scrub and the road drains blocked even on the wettest day no water could drain into the pond, instead we had a flow of water all the way down Chapel End to the cross roads on Main Street and a lot of disgruntled villagers complaining about the drains. 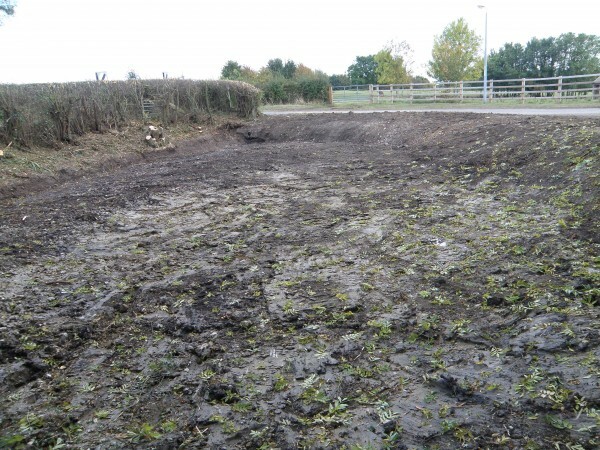 As the pond came under the auspices of the Parish Council it had been suggested a few times that some form of reclamation should be undertaken but each time budgetary constraints ruled this out. 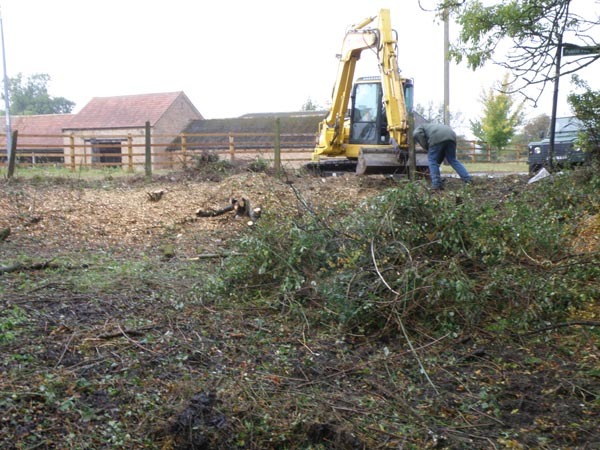 It then came to the notice of the Parish Council that Huntingdonshire District Council were offering environmental grants for schemes on a points basis. 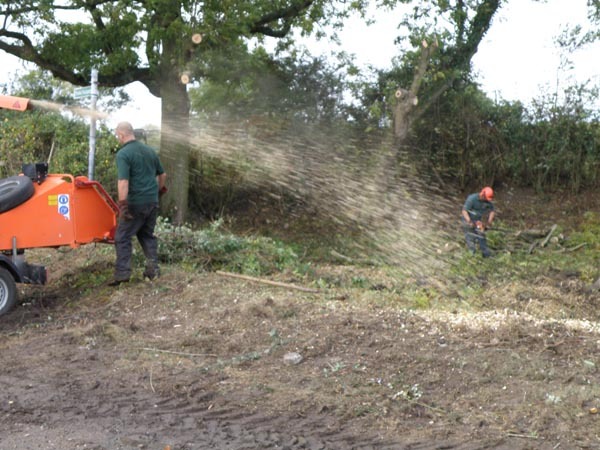 We made our case and were lucky enough to be awarded a grant to proceed with works. 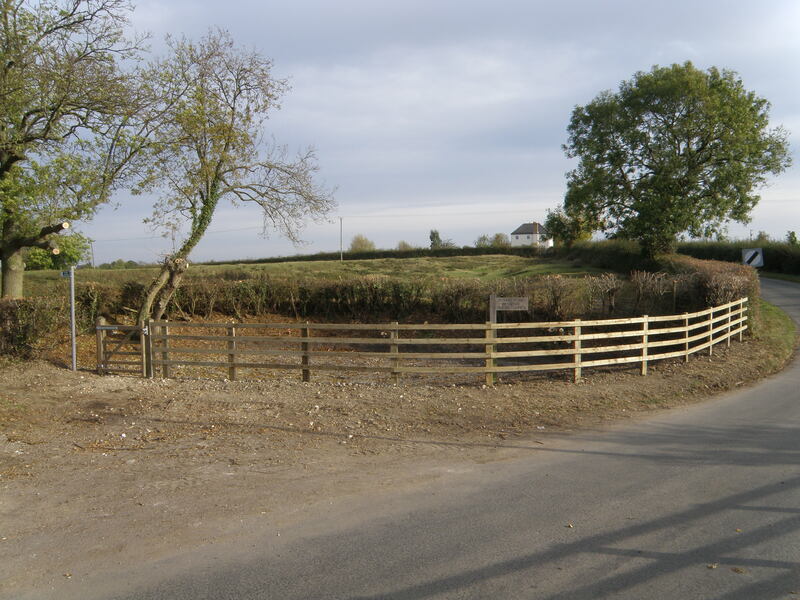 Quotes from contractors were sought andwere chosen to complete the works. 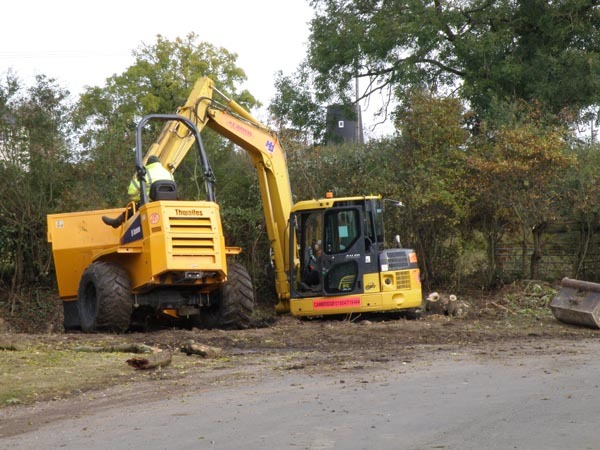 Lattenbury Services were chosen and the job commenced in October 2009. 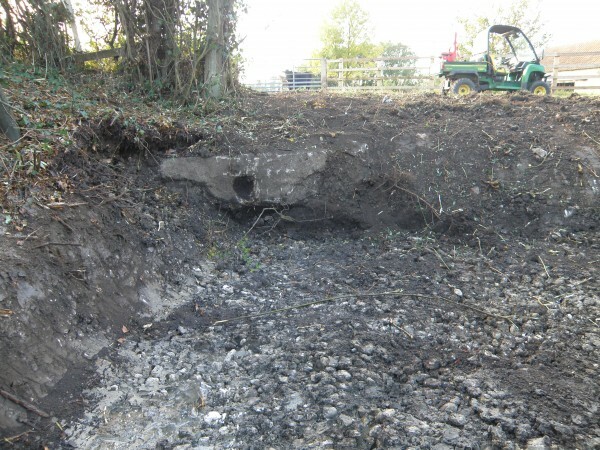 A specification for excavation and remedial work was drawn up, it was agreed that all the green material around the front of the pond would be lost and the backdrop of the hawthorn hedge and ash trees would be retained subject to some trimming back. 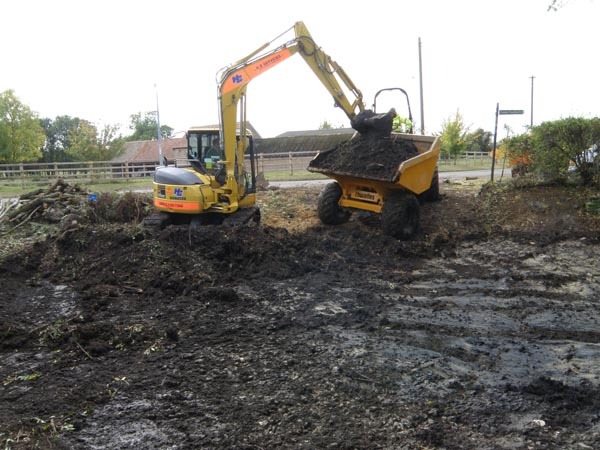 Midi digger and Midi dumper (not mini) Excavating the years of silt and associated rubbish from the pond. 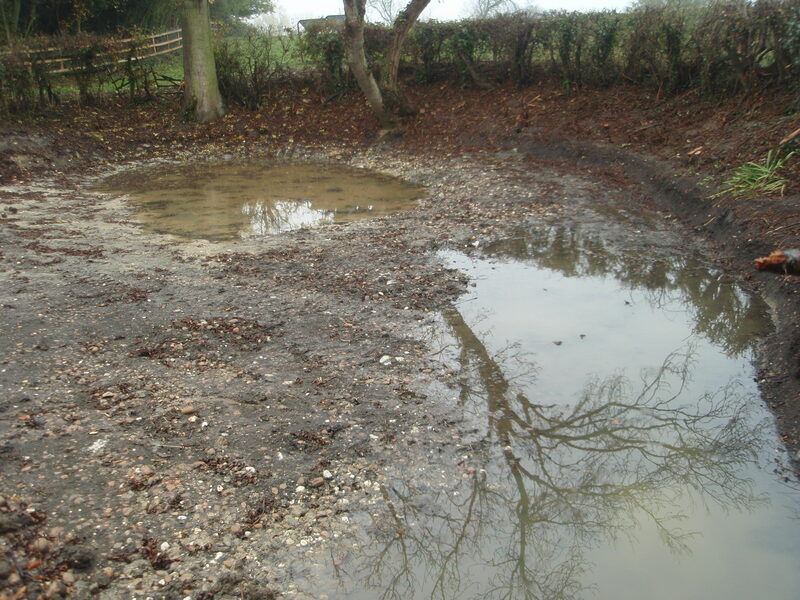 It was suggested on the initial survey that the pond had a hard base, this proved to be the case with a graduated cobbled bottom in excellent condition. So someone years back put a lot of effort into creating a pond where the mud wouldn’t stir up to much when livestock drank. There is also the suggestion that cart horse would have had their legs washed down after a days work in the field particularly if it was muddy going. Chipping the green material, this was then excavated with the spoil. 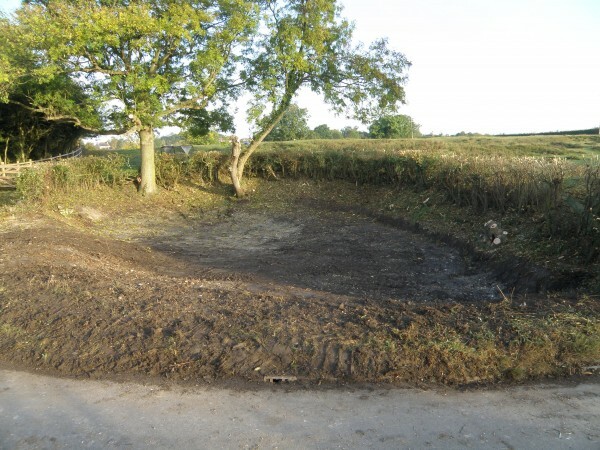 The above picture shows two things, first the completely silted up drain that stopped any road surface water from entering the pond and secondly the cobbled base of the pond which was in excellent condition and allowed the contractors to profile the pond to its original depth. The pond cleared out to the stone base without too much damage. The shape of the pond on complete excavation and trimming of green materials. Laying out the fence line. The completed project, just add water. Two years on almost to the day and the aquatic life is thriving. 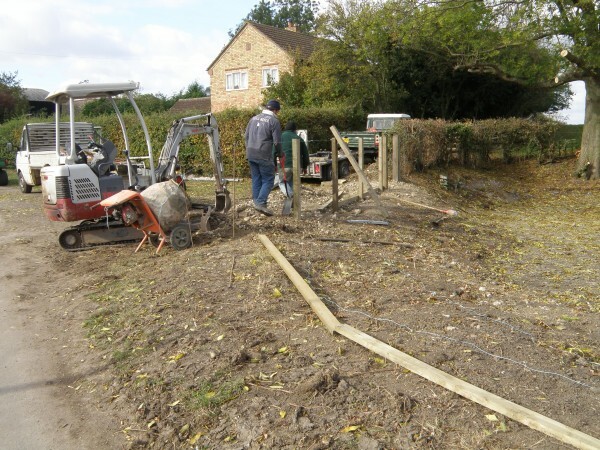 The pond holds a good level of water and the drains work well both for filling and preventing overflow and consequently we have an environmental area that is attractive and functional. Bringing the story right up to date, the pond supports a thriving population of Great Crested Newts. 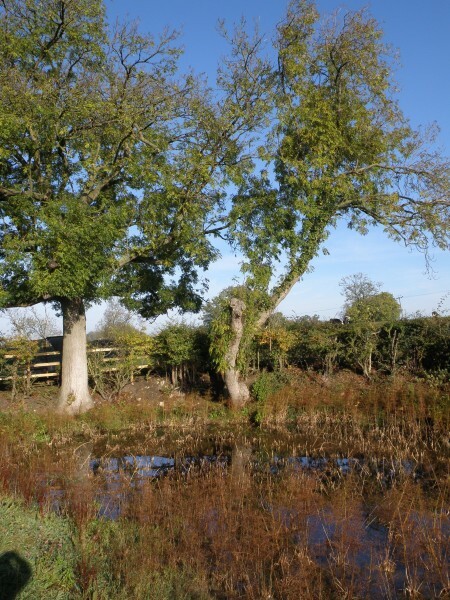 Chapel End pond is now part of the Great Gidding Newt Trail. 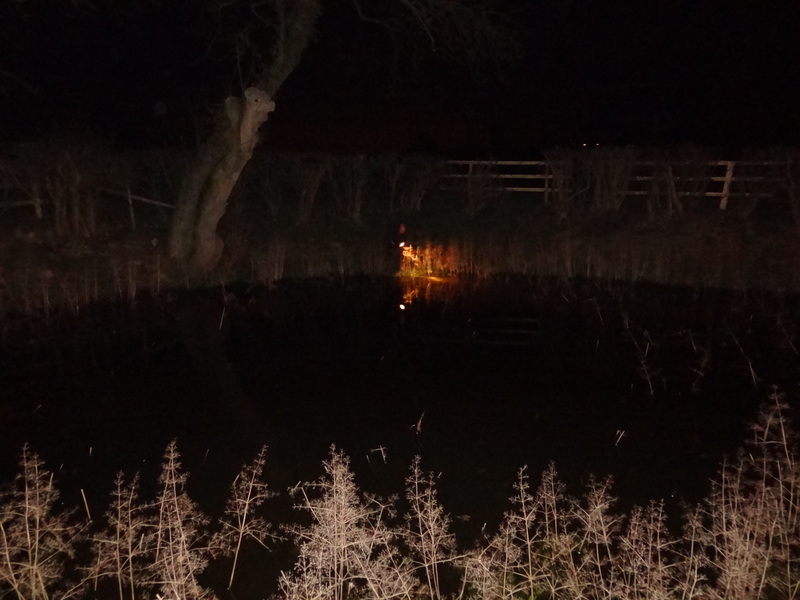 An evening photograph of a newt survey underway. 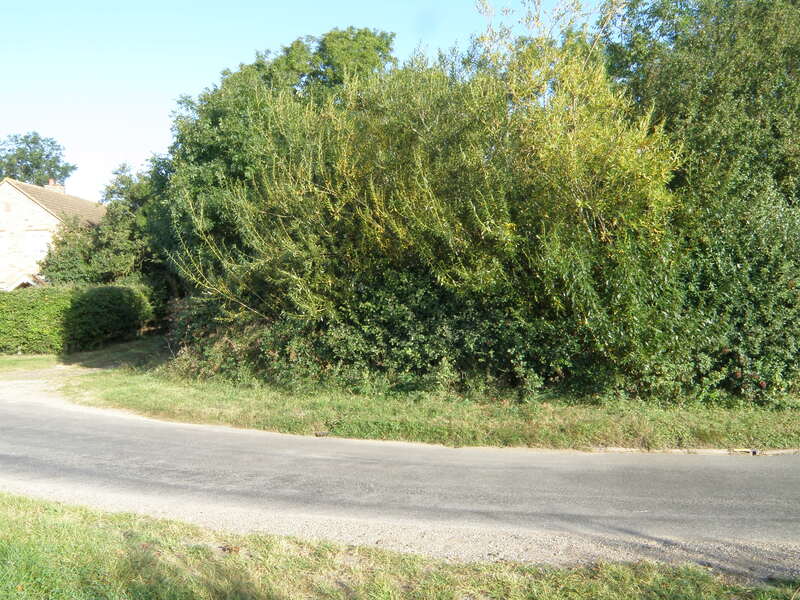 I have just visited a 98 year old Ringstead resident who speaks fondly of visiting her grandparents in Great Gidding. 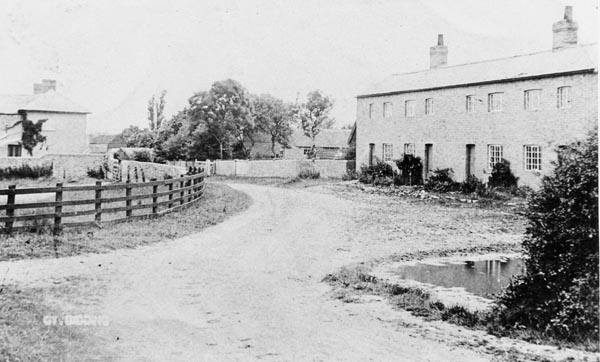 They lived in a farmhouse opposite a pond which had a row of cottages next to it. I presume she is talking about this pond. She says she would love to return to see it in the warmer weather. In the meantime I will show her some photos. Thank you for making contact through the website. We have a (small) History Group that meets in the village, and are always interested to hear from people who have had a connection to the village (either Little/Steeple/Great Gidding) in the past. What was the name of the grandparents? I would be happy for you to make contact before your visit, and it may be possible to meet up and share her memories. I too would be interested in hearing from the History Group. My great great great grandparents are buried in St Andrew’s churchyard, Steeple Gidding. After many years of being told that I was 1/2 Yorkshireman, I now find that the family was from Huntingdonshire. Coincidentally, I lived in Warboys until 1993, without ever knowing the proximity of my roots. Mr Gilby – Thank you for making contact. As with the previous enquirer, it is always interesting to make links with family members of past residents. You don’t mention the family name, or what you would like to know, so please make contact again with a few details. I must be honest and say that we do not have a great deal of information about Steeple Gidding, but I am happy to look through and see if there is any information that may help you.